Always remember that the ear is a delicate structure. When inflamed or infected it may be very painful. The ear is really just a canal or tube lined by skin. If a pet has underlying skin disease it is common to also have ear issues and it is fairly uncommon for a pet to just “get an ear infection”. Instead it is often a sign of underlying skin disease or systemic allergies. The anatomy of some breeds can affect the ear’s ability to stay healthy. Whether it is a too narrow passage or an ear with excessive secretions these are typically lifelong issues. The ear canal is L-shaped with a vertical and horizontal portion. The vertical portion is visible to the naked eye, the horizontal portion is visible only via a veterinarian’s otoscope. 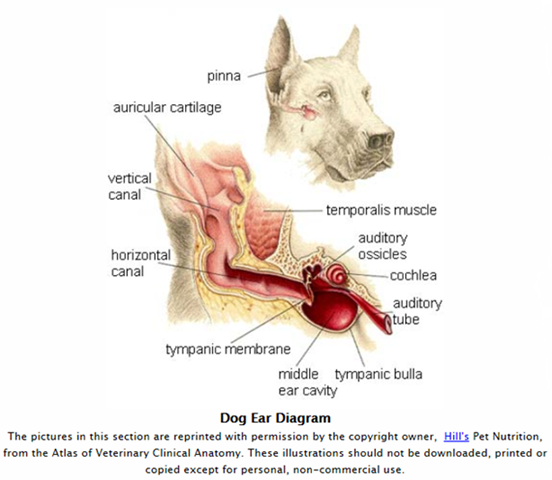 The tympanic membrane (TM) lies at the end of the horizontal canal. Often a pet owner may see a normal appearing vertical canal while the otoscope may reveal a completely occluded horizontal canal. 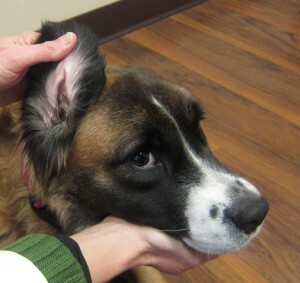 To address ear disease both the vertical and horizontal portion of the ear must be treated while protecting the TM. The TM or eardrum can be damaged by disease, medications, or objects placed into the ear (i.e. Qtips). While the eardrum can heal, damage can also potentially affect hearing longterm. If you feel you are not able to safely treat your pet’s ears, do not proceed. Ear cleaning can be scary and painful which could potentially make a normally docile animal become aggressive. Before starting, gather supplies: ear medication, towels, treats, old clothing. Location, location, location-find an area where your pet can be confined. An elevated surface or corner of a room often works well. Having an extra pair of hands is often helpful. For smaller animals a towel can be used to “burrito” wrap and better control the process. Find an appropriate area to work in. Flooring with good grip or the ability to have your pet sit with their bottom against a corner or wall may be helpful. Hold the ear flap up vertically with your non-dominant had allowing visualization of the ear canal. Holding medication in dominant hand, place the opening of the ear medication (often a spigot or long slender dropper) over the opening into the ear canal and gently squeeze instilling ointment or liquid into canal. Hold the ear flap (also called the pinna) closed like a resealable bag. Massage the base of the ear briefly as long as not too uncomfortable for pet. Allow pet to shake head, medication may come out but some will stay in. Wipe inner ear flap if necessary to clean off any residual debris. Give treats and verbal praise throughout process. This entry was posted in DIY, Ears, Medications on June 3, 2015 by admin.